Simple Integration – The AccuMail Verify address verification API is designed for rapid deployment, in both REST and SOAP environments, so you’ll be up and running in as little as an hour! Certified by the USPS - CASS Certified for accuracy, the AccuMail Verify API instantly validates addresses against the very latest postal database from the USPS. Total Address Accuracy - addresses are verified, standardized, and any missing elements such as ZIP+4 or County Code are added to each record. Built-in RDI - the Residential Delivery Indicator feature lets you know whether each address is a residential or business address - which can lower your shipping costs, as well as give you greater insight into the addresses in your database for marketing purposes. Full Customization – AccuMail Verify API gives you control over the look and feel of your web forms for seamless integration within your website or other applications. 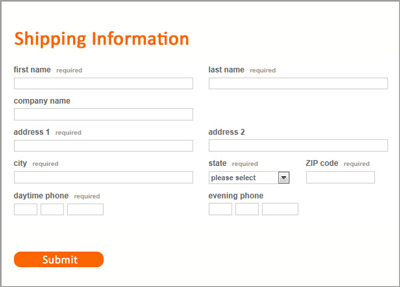 Labels, buttons, input fields and tabs can all be customized with different sizes, colors, fonts and placements. Competitive Pricing – No Maintenance Fees. Call or email us for more information. Secure Data Network - we ensure the security of your data through a variety of methods including binary transformation of customer data, server-side authorizations of user accounts, custom product licensing, database authorizations and client access auditing. Simple Account Management - your unique user portal lets you check your usage in real time, and view and print invoices. To download an AccuMail Verify brochure, click here.